First the good news: the Toshiba 32C3030 uses an astonishingly low 0.1W while in standby mode. And this is an achievement that's backed up by a decent operational power consumption figure of 154 watts per hour. As we discovered, it's a good job that the standby mode is so energy efficient, as switched off is the best thing for this 32in LCD. Not that you'd tell from the specification. Inevitably for these times, the 32C3030 is HD-ready, with a native resolution of 1366 x 768, quoted brightness of 500cd/m2 and a quoted contrast ratio of 4000:1. 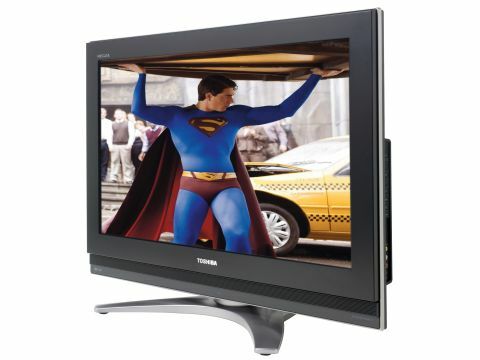 Connections don't reach the stellar heights of its rivals from Sony and Panasonic, but two HDMIs are acceptable on a £500 32in LCD TV. All the other usual connectivity suspects are present, including two Scarts (both RGB-enabled), component video input, a PC input, and plenty of AV inputs and outputs - including one for hooking up a subwoofer. The 32C3030's feature count is also praiseworthy for an aggressively priced LCD. There are built-in analogue and digital tuners, Toshiba's usual Active Vision LCD processing suite (which - in theory - reproduces four times more colour tones than other LCD TVs), backlight reduction control, and the excitably named SRS WOW audio system. With the impressive contrast ratio of 4000:1 and the Active Vision Processing suite at the 32C3030's disposal, we had high hopes for the hi-def picture quality. But our HD DVD test movie of Hulk left a bitter taste in our mouths. Close-ups in Hulk can show off some decent levels of fine detail, but the darker areas of the picture leave something to be desired. Black levels are plagued with the kind of mediocrity that we're frankly astonished to see from a reputable manufacturer as Toshiba. If you sit anywhere than directly in front of the LCD screen, you'll be faced with mush that's as grey as Pete Docherty's skin on a good day. The 32C3030 attempts to win us over with some deft motion moves: fast-moving sequences are delivered with scarcely a trace of blurring that can be the bane of swift camera pans. Bright hi-def footage is also impressively executed, rendered with a luscious colour palette. Unfortunately, it's too little too late, as those frankly rubbish black levels undo the good work. Worse still is standard-def footage. Spin a DVD of Hulk and the air will turn blue at the feeble standard-def pictures on offer: judder, noise and smearing all make unwelcome appearances. Freeview pictures are also noisy as hell. Picture-wise this is a major disappointment and best avoided. At least the nicely monikered WOW suite lives up to its name, working a treat on the 32C3030's soundstage, and lending the action sequences some dynamism that the pictures are sorely lacking. The 32C3030 is a depressingly mediocre LCD TV, made all the worse by the relatively high expectations that we had from Toshiba. There are too many traditional problems with LCD technology - the worst offender being dreadful black levels - for us to recommend this 32in TV, especially as rival brands are ensuring that HD-ready screens at this size are real hi-def performers.